28mm Victorian Warfare: See you soon! 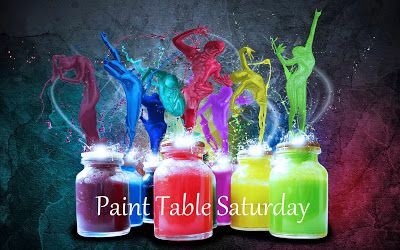 A fifth saturday in August; some will tell you this is an incredibly rare occurrence, but for me it simply signals the end of another fabulous summer holiday. Yes, tomorrow will be spent polishing an apple and packing the satchel as we look to start a new academic year. This is always an incredibly busy, exciting and demanding time of year and so, with some trepidation, I have decided to repeat last year's decision of taking a break from Blogging. At this time of year, I always struggle to maintain a viable presence not only with my own blog, but in the visiting of those that I follow. 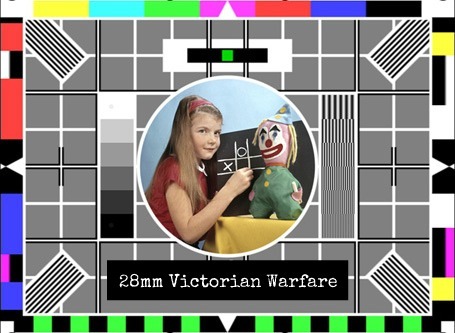 I find this frustrating as '28mm Victorian Warfare' has become intrinsically linked to my hobby enjoyment. Rest assured that this is only a temporary glitch, I'm hoping to keep painting as an escape at the weekends and it is very much my intention to return refreshed and raring to go at the end of the month. The summer, although productive hobby wise, didn't yield as much as I had hoped for. One disappointment was not playing some of the 'Witchfinder General' scenarios that I had earmarked for the holiday. There was a frantic bout of terrain building, but the planned development of the spare room to accommodate a gaming table, sadly didn't materialise and so things are once again on hold. 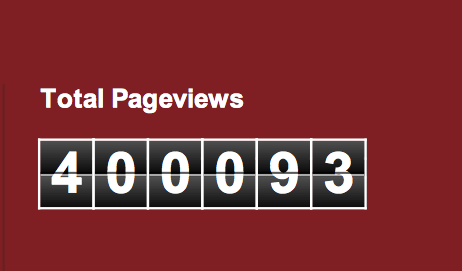 There was, however, a significant milestone reached in regards to pageviews - 400,000 no less! I can't tell you how thrilled I am at this and would like to take this opportunity to publicly thank all that visit and especially those that leave a comment; your continued support is always gratefully received. So what can we look forward to on my return? 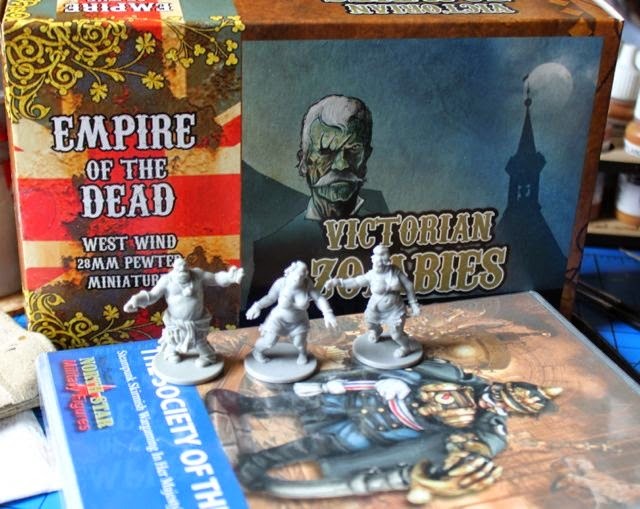 Well there is of course 'Zomtober 2014' to look forward to, a wonderful opportunity to add to the shambling hoard as well as doing something completely different. 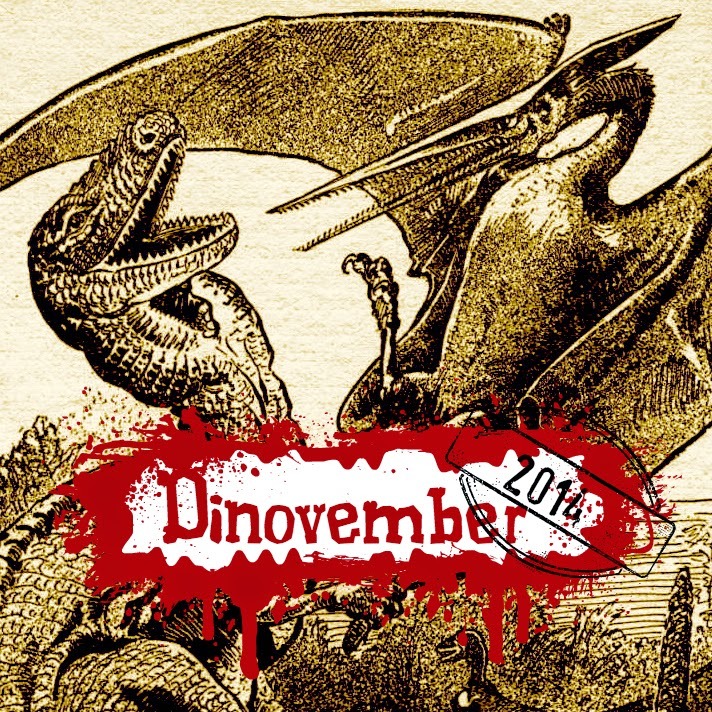 I shall also be resurrecting 'Dinovember' just because I can! This is little more than self indulgent nonsense, but something that I find hugely entertaining. There is the possibility that one day it might all lead to a game or two, but I wouldn't hold your breath! Finally of course there is the 'Analogue Hobbies Painting Challenge', although nothing official has been mentioned as to whether or not this great event will be happening this winter, it is around this time that thoughts start to turn to what might realistically get painted, which in turn might lead to the possibility of a few additions the lead pile. So farewell for now and do hope to find many of you on my return in October - always a concern when planning a self imposed exile that everyone might decide to up sticks and go! Finally, just a quick shot of what has made it to the painting table in preparation for later in the year. Take care. We anxiously await your return. I say old bean you will be missed. Hurry back and don't take any lip from those owiks! PS: "life on mars" is a great TV series, well chosen image! Fare thee well, Sir Michael! I'm very, very much looking forward to seeing you again, when your hurly-burly's done. Good luck with the new academic year, my good chap! See you on your return ol' chap! Tis a strange thing having to depart a hobby to catch a breath, recharge the wallet, dream & plan the possibilities, then return with a vengeance. See you on your return Michael. I am utterly unsurprised by those page view numbers, and am glad to see your stirling work is being enjoyed by many. We shall miss you but your return to the blogosphere will be well worth the wait! Enjoy the break Michael. If that's possible? Look forward to your return later in the year. Which should co-inside with the return of the Walking Dead on Fox! I am tempted to do the same as you ...so enjoy your break, see you soon! I'm looking forward to Dinovember!!! No one will leave you whilst you're away from blogger. I hope work doesn't drain you too much. On the other hand, Dinovember eh? . . .
Congrat's on the pages views Sir! We will catch up upon your return, Michael! Good luck with your break! 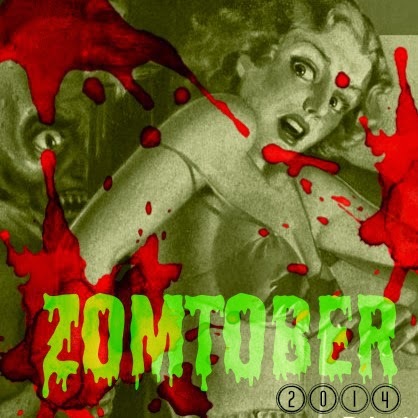 Will look forward to seeing you back and raring to go for Zombtober! Take your time. Catch your breath. Center yourself. Find peace. Then return to us renewed and recharged. I had never heard of Dinovember before, and I have just the minis to paint for this. Thank you for reviving it. I also think I shall actually paint something for Zomtober after my epic fail last year of completing absolutely NIL. Enjoy the hiatus! I can say categorically that your absence will be felt, so don't stay offline too long. Congrats on your well deserved landmark, and back to school with you! Have a good break and come back stronger. Congrats on the numbers too! What can I say? there is 40k then there is 400K your pageviews soar where angles fear to tread you be missed. But now that you are moving over to the Victorian dark side Zombtober will draw you back. "everyone might decide to up sticks and go!" Not likely. We'll be here on your return. Like the post title says: see you soon. Looking forward for your return mate! Looking forward to seeing what you do with those EotD zombies! Summer holiday photos off to the printer? Check. New pencils? Check. New spiral bound notebook? Ready. New school diary? Ooo....watch the spine....yes, ready. Copy of the new timetable....ready. New mug for the staff room? Check. Seriously, have a wonderful September with the kids, and see you soon for the rest of a wonderful autumn! Good luck with the start of the school year. I enjoyed catching up with the blog and look forward to your return. I hope we can cross brushes again in either the Anologue or other challenge. In a friendly way of course as I hold your skill in high regard, if not awe. Enjoy the start of the school year Michael! I look forward to your return later this autumn. Relax and no stress.Welcome back! I understand sometimes life just gets in the way of the hobby and priorities taken care of. I look forward to your, hopefully, imminent return! A timely reminder, thank you my good man.